Ashaway, RI — Racquetball great, leading coach, and now racquet manufacturer, Cliff Swain has become the latest player to join Ashaway Racket Strings’ roster of sponsored players. The Hall of Famer who currently coaches Maria Jose Vargas, Jose Rojas, and Coby Iwaasa among others, recently introduced his own name brand racquet and swears by Ashaway’s PowerKill® 17. After the most winning career in racquetball history, Cliff retired from the IRT after the 2006-07 season, but has stayed active in doubles and outdoor racquetball, winning the USA Racquetball National Doubles Championship in 2008 with Woody Clouse; and in 2012 and 2013, teaming up with long-time friend and former coach Mike Ladge to win three national 45+ doubles titles. In 2014, he and partner Josh Tucker won the World Outdoor Racquetball (WOR) Pro doubles division taking out Pro Rocky Carson and Jose Rojas in the semi finals. In addition to his professional coaching work, Cliff continues to play WRT events, and is also very active with youth leagues, teaching lessons and hosting clinics for the RYDF (Reaching Your Dream Foundation). In July 2014, Cliff introduced his own Cliff Swain Signature Series racquet, which features compressed graphite construction, displacement channels to improve in-plane stiffness, and a large 107 sq. in. string bed that maximizes string deflection and increases the sweet spot by 20%. Cliff has announced that these racquets will be strung with Ashaway strings. For more information on Cliff Swain’s new racquets, his coaching, video blog, and other activities, visit cliffswain.com. 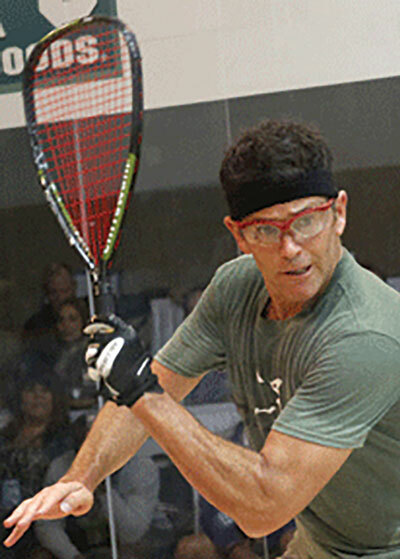 Racquetball great, leading coach, and now racquet manufacturer, Cliff Swain has become the latest player to join Ashaway Racket Strings’ roster of sponsored players. The Hall of Famer who currently coaches Maria Jose Vargas, Jose Rojas, and Coby Iwaasa among others, recently introduced his own name brand racquet and swears by Ashaway’s PowerKill 17.